Take train to the Arts Center stop. Then take bus #23 to the corner of 26th Street and Peachtree Rd. Take Peachtree Street Exit 86. This exit becomes GA-13 South (Buford Highway). Take Peachtree Street exit ramp toward the Buckhead district. Turn right onto Peachtree Street NE. Travel approximately 1/2 mile. 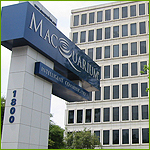 The Macquarium Building will be your left. Parking entrance is on far side of the Macquarium sign and next to R. Thomas Restaurant. Take the 10th/14th/17th Street Exit. Turn left onto 14th Street. Travel approximately 1/4 mile. Turn left onto Peachtree Street NE. Travel approximately 1 mile. The Macquarium Building will be on your left. Parking entrance is on far side of the Macquarium sign and next to R. Thomas Restaurant. Reception is on the second floor. Take the Sidney Marcus Boulevard Exit toward Piedmont Road/Lenox Road. Turn left onto Sidney Marcus Boulevard. Turn right onto GA-13 South (Buford Highway). Take Peachtree Street exit ramp toward the Buckhead district. Turn right onto Peachtree Road NE. Travel approximately 1/2 mile. The Macquarium Building will be on your left. Parking entrance is on far side of the Macquarium sign and next to R. Thomas Restaurant. Reception is on the second floor. Take the 10th/14th/17th Street Exit. Pass over 10th Street. Turn right onto 14th Street. Travel approximately 1/4 mile. Turn left onto Peachtree Street NE. Follow Peachtree Street over 85 overpass toward the Buckhead district. Travel approximately 1/2 mile. The Macquarium Building will be on your left. Parking entrance is on far side of the Macquarium sign and next to R. Thomas Restaurant. Reception is on the second floor.